ATLANTA – A rapidly strengthening Hurricane Florence chugged across the Atlantic on Sunday toward a possible direct hit on the U.S. Southeast late this week, triggering warnings to people up and down the coast to get their emergency kits ready, map out escape routes and fill sandbags. Red flags flying on beaches warned swimmers to stay out of waters already roiled by the distant storm, and cruise ships and Navy vessels were being steered out of harm’s way. People rushed to buy bottled water, plywood and other supplies. Florence crossed the 74 mph threshold from tropical storm to hurricane Sunday morning, and by evening its winds were up to 85 mph. As of 5 p.m., it was centered about 720 miles southeast of Bermuda, moving west at 7 mph. 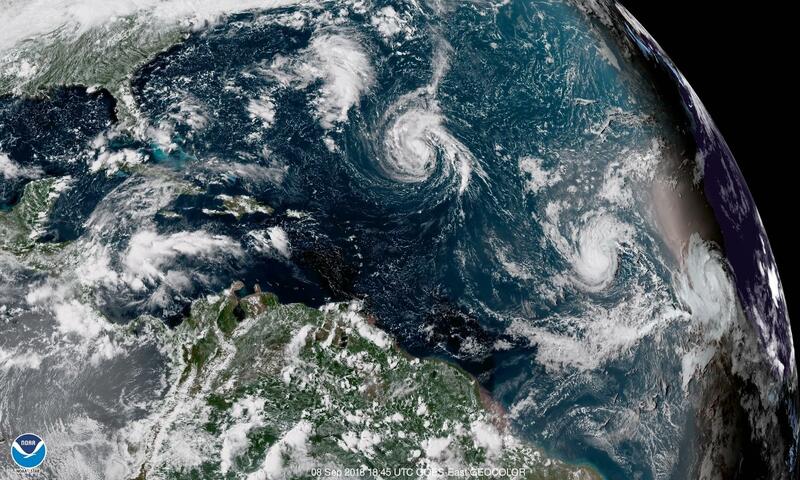 Drawing energy from the warm water, it could be a fearsome Category 4 with winds of 130 mph or more by Tuesday, the National Hurricane Center said. The Miami-based hurricane center said that it is too early to know what path the storm will take but that it could roll ashore in the Carolinas by Friday. Forecasters urged residents from South Carolina to the mid-Atlantic to get ready – and not just for a direct blow against the coast. They warned that Florence could slow or stall after coming ashore, with some forecasting models showing it could unload a foot or two of rain in places, causing devastating inland flooding. The governors of North and South Carolina and Virginia declared states of emergency far ahead of the storm to get ready. Published: Sept. 2, 2018, 9 a.m. Updated: Sept. 9, 2018, 3:35 p.m. Tags: Florence, hurricane, nation, news, Southeast, U.S.